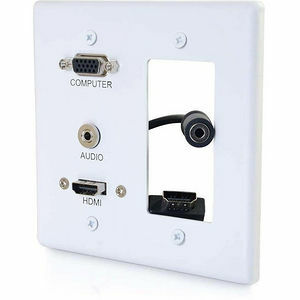 The HDMI, VGA and 3.5mm Audio Pass Through Double Gang Wall Plate is perfect for the transition to in-wall cabling. This solution offers a clean, professional look and is ideal for classrooms, conference rooms and houses of worship. The HDMI and 3.5mm Audio pass through ports include thin, flexible pigtails that accommodate the tight bend radius required for installations within a standard junction box. In addition, the decorative cutout provides a space for additional components like our USB Superboosters that fit a standard opening. Constructed of high quality aluminum, this wall plate is designed for durability and a long life in commercial environments where constant wear and tear causes damage.